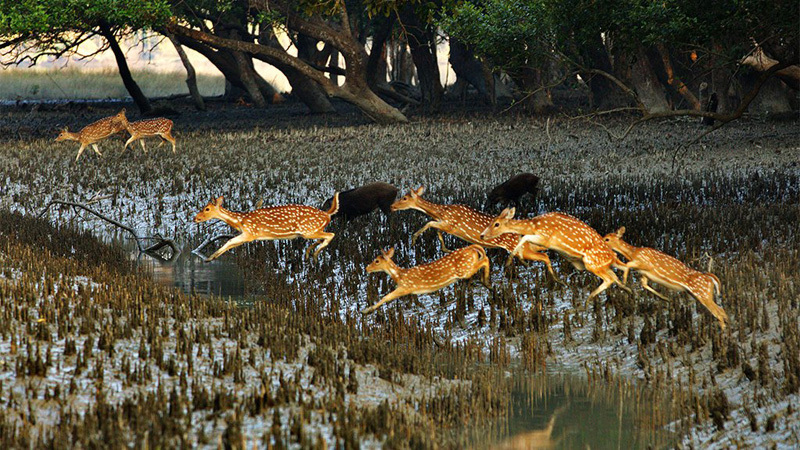 Bangladesh, like many other countries, needs to find space for both the wildlife and its people keeping in mind that biodiversity is important for the world, says a renowned global wildlife expert. “Everybody has a role to play,” Dr Craig B Stanford, a professor of Biological Science and Anthropology at the University of Southern California, told UNB in an interview saying tigers, turtles and fish are important, and also very important their protection. He said there are many dedicated people and conservationists in Bangladesh though many people around the world ask the conservationists why they do worry about these animals – turtles and monkeys -- when there are many people who do not have food to eat. The US professor said he is fully aware of the issues like big population density and other problems but biodiversity is very important to the wellbeing of the planet. Highlighting the importance of having space both for wildlife and people, he said there are many species and it is hard to even know which species is the most important one. “If we lose them, before we understand, we’ve lost important things for ourselves,” he said adding that turtles are playing an important role in ecosystem. Prof Stanford visited Chittagong Zoo and Hazrat Bayezid Bostami shrine recently and had a very “productive” discussion there on how to protect the turtles. He talked to khadem (caretaker) of Bayezid Bostami shrine conveying that he wants to help protect the turtles. “The shrine, as khadem told me, is very dependent on the turtles. Farid Ahsan, a zoology professor of Chittagong University, who studied this black soft-shell turtle, in his 1984 survey, recorded around 320 Bostami turtles in the shrine pond and the number has declined in a very significant way over the past decades. The black soft-shelled turtle, a freshwater species, found in Chattogram and India’s Assam State and was declared ‘extinct in the wild’ in 2002 by the International Union for Conservation of Nature. Pof Stanford mentioned that the rarest of turtles as well as tortoises that need to be preserved are found in Asia. “Many of the tortoises and turtles which are found in captivity, are extinct in the wild,” he said. Stanford said the success rate of saving endangered turtle and tortoise species is very low and also pointed out key reasons behind the endangerment and extinction of tortoise and turtle species which are --- loss of habitat, serving as food in central Asia and pet trading. He stressed raising awareness and dedication of people to preservation of the species of turtles and tortoises which are endangered and near extinct. Asked about wildlife trafficking, the US professor, who also visited Bangladesh in 1986 and 1988, said this is a problem in many countries and people are of course making money from that. “I think Bangladesh should do everything they can,” he said giving importance to stopping any illegal international illegal such cross border trade. “The financial scale of illegal wildlife trading rivals that of drugs trading,” the professor. Prof Stanford said educating people is also very important as many people have no idea about how and which animals are critically endangered. Talking about the role of young people in Bangladesh, he said many young people only focus on their careers and think of doing conservation work if it does not lead to good paying in their careers. Prof Stanford, however, said the young people can still do interesting projects with people who are working in this field which will actually help them. “So, I think, the young people are actually critical, they’re more open minded, they tend to be more environmentally aware and interested,” he said. Prof Stanford laid emphasis on educating people in Bangladesh about turtles and tortoises to avoid their extinction. He also encouraged young people to become environmentally more aware and interested saying their role is critical. Prof Stanford stressed the urgency to save globally endangered species of turtles and tortoises, including in Bangladesh, and discussed some possible cooperative plans. The wildlife expert, on March 16, spoke at an interactive session titled ‘Turtles in Trouble: Conservation Priorities in the 21st Century’ in the city arranged by Noazesh Knowledge Centre (NKC), an endeavour of WildTeam. Prof Stanford has worked in countries like Indonesia, Cambodia, Thailand, Northern India and more. He is the Chair of IUCN Tortoise/Freshwater Turtle Specialists Group, 2017-2021.UNB.